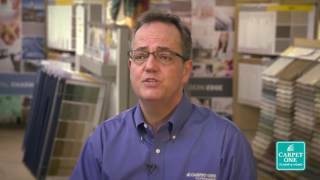 Bachmeier Carpet One Floor & Home in Coralville, IA is your local hardwood flooring leader. We offer a great selection of high-quality hardwood options, and we also provide expert design and installation advice to make sure your new floor fits perfectly into your home setting. How do you choose the right hardwood floor? We eliminate the stress associated with buying a new hardwood floor by using a unique process to match you with a floor that suits your lifestyle as well as home decor. Although hardwood flooring requires an initial investment, but over time pays for itself with lasting durability and added home value. Homebuyers love hardwood and are willing to pay for a home with hardwood flooring. You should plan on where you want to install your hardwood first before you choose the type of hardwood you want. For example, solid hardwood should only be installed in rooms that are cool, dry and have low traffic like bedrooms, living rooms and dining rooms. The layered construction of engineered hardwood allows it to be installed in kitchens, hallways and even basements. So long as you care for your hardwood floors and do not continuously beat on them, they will last a long time in your home. No matter the type of hardwood, you should avoid installing it in kitchens, bathrooms, and laundry rooms because of the amount of heat and moisture. Hardwood is available in solid and engineered constructions. Solid hardwood features a rather uniform construction, as the planks are made from single strips of real wood. Engineered hardwood flooring, however, is made from different layers of wood that are pressed together. Consequently, engineered hardwood is more dimensionally stable than solid hardwood, so it can be installed below, on, or above ground. We recommend choosing engineered hardwood if you have significant foot traffic and some moisture in your setting. In addition, you’ll need to choose a hardwood style that fits into your home design. There are traditional, rustic, and even exotic (such as cork and bamboo) styles available, and each seems to add its own unique character to your setting. Rest assured that our design experts will help make sure that your new floor accommodates your desired design. Hardwood not only comes in different constructions and styles, but it is also available in different species. The different hardwood options include maple, cherry, oak, and birch, among others. Each wood option offers unique shades and character, and they also feature different strength levels and wear resistance. For unique looks, be sure to consider wood flooring types like bamboo and cork. Bamboo has a light hue and sophisticated patterns of dark markings; while cork has a more natural and unique look. We are happy to offer Carpet One exclusive brands like Invincible and Rustic River as part of our hardwood selection. Invincible offers traditional wood looks, while Rustic River offers high-character and rustic styles. We also offer specialty styles from Mannington, Shaw, and Castle Combe. We love Castle Combe hardwood because it can add 19th century charm to your home! We’ll also be sure to work with you to handle hardwood installation. We can accommodate any schedule you have in mind, and since we only work with installation experts, we can ensure that the project will go smoothly. There are a few different hardwood options from which to choose, so be sure to let our experts help you make the best choice for your room. Hardwood flooring is a great choice for many interior spaces and you’ve chosen well. But which hardwood is your perfect match? Here are some tips to help narrow down your selections. Maintaining hardwood flooring isn't as daunting as it may seem. Visit our Flooring Guide to learn about hardwood maintenance.